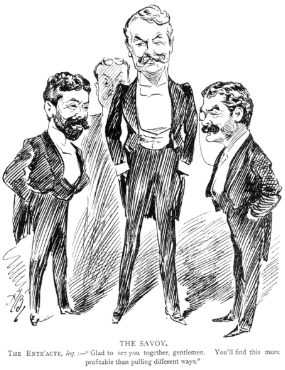 Richard D'Oyly Carte, W. S. Gilbert, and Arthur Sullivan together for "Utopia Limited." Arguably, the original dynamic duo was none other than writer William Schwenck Gilbert and composer Arthur Sullivan (who are often simply referred to as Gilbert and Sullivan). Despite most of their work being social commentary on their Victorian surroundings, they, like Arthur Miller in the 1950s and Shakespeare himself three centuries prior, have had their works become an integral part of the theatrical canon. I first came to know Gilbert and Sullivan through, strangely enough, seventh-grade science class. Dr. Schroeder had just played the Elements Song on the board, and, intrigued, I looked it up – finding that the tune was taken from the operetta The Pirates of Penzance and its iconic Major General’s Song. I found the plot hilarious (in a reserved nineteenth-century way) and the characters poignant, even in today’s world. Many of the duo’s more popular works (especially Penzance, H.M.S. Pinafore, and Iolanthe) share a plot of love lost and love found all in the face of powerful adversity. The shared similarities in the plot do make it easier to realize the nuanced social commentaries about British society near the turn of the twentieth century. Each of the comic operas, though, do reach a happy ending – invariably, it is either outright stated that the star-crossed lovers do end up marrying, and all is right in Arcadee/Japan/Cornwall/wherever. Overall, though, Gilbert and Sullivan demonstrate the foibles of our human condition and make opera accessible to the Anglophone world.